Want to organize your home better with wall organizers and improve your decor at the same time? Here are the top 10 best rated wall organizers to choose from in 2019. There is no other home accessory so small yet one that has such a significant impact as a wall organizer. It’s not expensive, and it’s easy to install, so you don’t have to invest much or get committed to getting one. However, it can mean a huge deal to the organization of small items around your house. Whether it’s in the entryway to organizer you mail, or in the kitchen to keep small tools, or in your home office to sort your papers – the presence of a wall organizer is always felt. And the list doesn’t end there – you can use it in every room. So choosing one that fits your needs can be a bit tricky. That’s why we’ve gone ahead and examined a whole bunch of wall organizer to find the best for all needs. The top 10 list that we’ve come up with is not sorted by priority – you’ll find the best products for different needs. Check it out. For those who are looking for essential wall organizers, these premium pocket charts are ideal. They’re nothing fancy and don’t offer decor value, but they are efficient and durable. 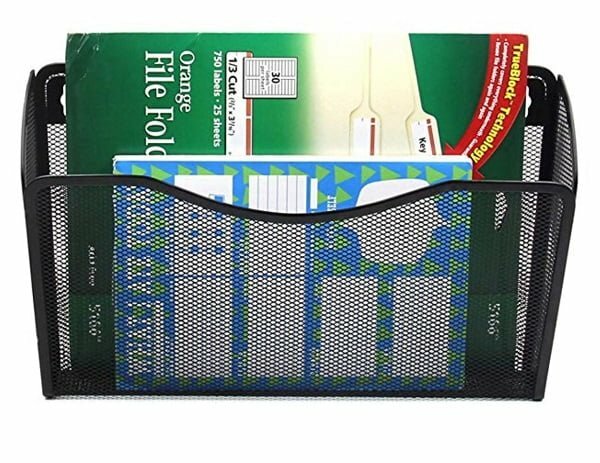 You’ll be able to easily organize all your paperwork, files, documents, magazines and office supplies. You get two pocket charts with this product, having ten pockets each. That makes 20 pockets and ample space for organization. If you’re not looking for decor value and organization is your main concern then these might be your perfect wall organizers. Why it’s our pick? 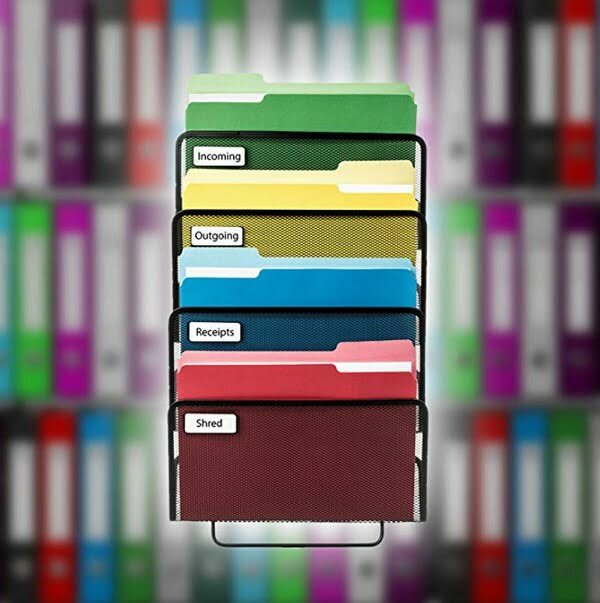 It’s a convenient way to organize your paperwork without spending much. 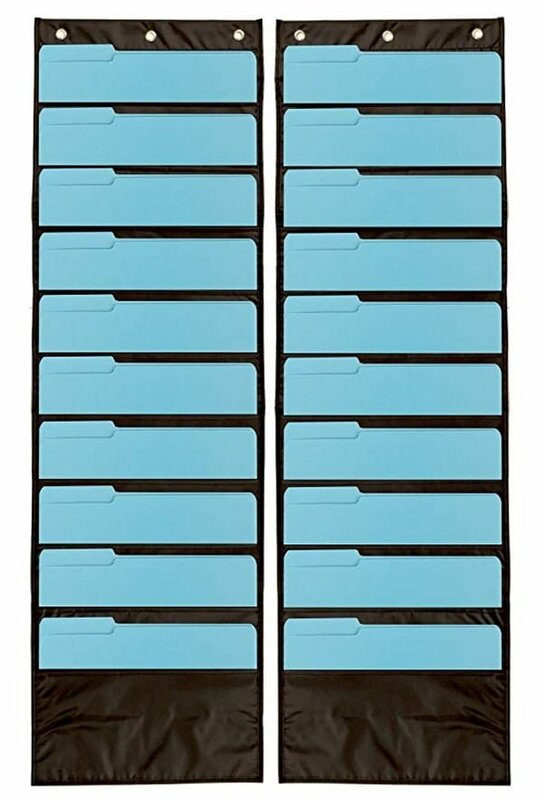 This organizer is also an Amazon’s pick. Available on Amazon.com. Looking for something compact but functional for your family command center? 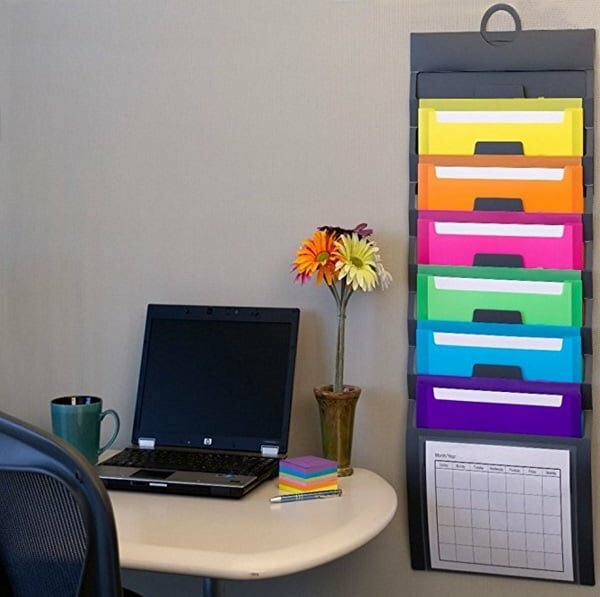 This cascading wall organizer will help you organize your paperwork or mail with ease. While it’s light and easy to hang, it’s also very durable, water and tear resistant. It will serve you a long time. It’s another Amazon’s choice and high quality but affordable product. And while it doesn’t offer decor value as well, it won’t become an eyesore either. Especially if it’s part of your wall organization space. Why it’s our pick? We love the simple but durable design. It’s an easy addition to your wall organizer space that you can get without much thought. It’s also available on Amazon. We realize that you might want more form your new wall organizer than just storage space. It can provide excellent decor value in places where nothing else can. 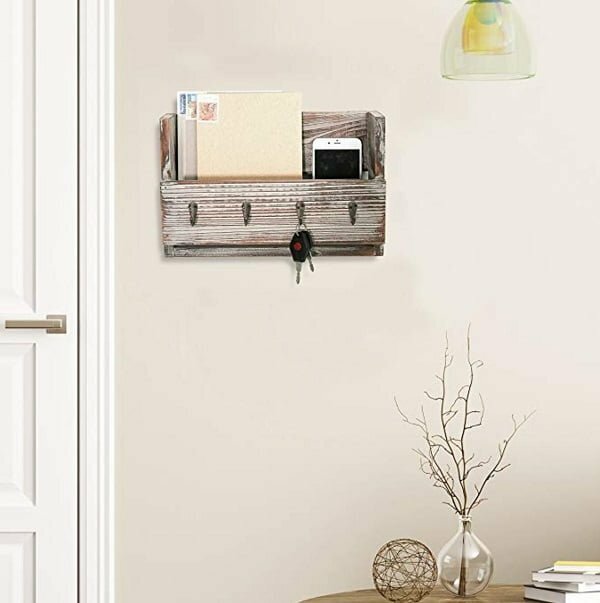 So this mDesign mail and key holder is the perfect addition to your entryway or mudroom that offers excellent decor value. It’s a sure conversation piece right when your guests enter your home. It will prove invaluable when it comes to mail storage as well! All in all this mDesign wall organizer it’s a great addition to your home organization and decor. Why it’s our pick? This wall organizer will give you much-needed storage space in the entryway as well as prettify your walls. Available on Amazon. This wall organizer is a roomy six tier magazine rack that will hold more than just your paperwork. It comes in a slick metal design that will work in any modern home. You can find many uses all around the house for it as far as organization goes. 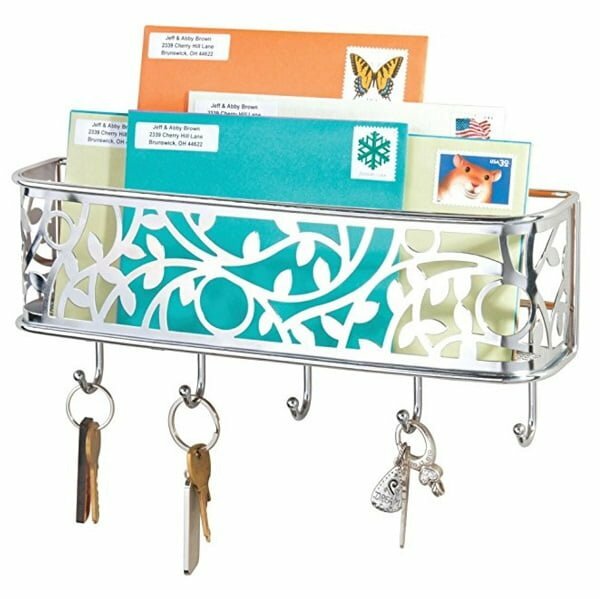 From mail holder in the entryway to the magazine rack in the bathroom or document organizer in the office. It has five tilted roomy trays for multi-purpose storage and one flat tray to store small things. The rack is made of stainless steel that’s very durable and will last a long time. You’ll love it for its purpose and style! Why it’s our top pick? It combines the best of design and storage value. The product is well made and is available on Amazon. Looking to use your empty wall space to its full potential? 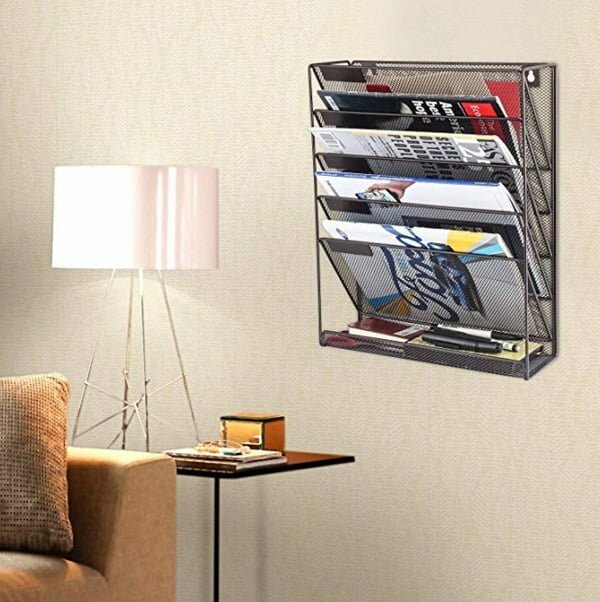 This 4-pocket hanging wall organizer will let you do that in style. It comes in a neat modern design and will not become an eyesore in any style of decor. Most importantly, it’s a very sturdy metal rack that will hold all kinds of things. Want to store books or even small tools? This is the perfect organizer for that. It can be added to any room of the house. The mounting hardware is included so you can pretty much use it out of the box. All it takes is an easy installation to hang it on the wall! Why it’s our pick? It’s one of the most durable wall organizers. It also helps that it’s well designed and doesn’t become an eyesore in decor. Available on Amazon. If you need more versatility in the way to install a wall organizer, these mesh pockets will help you with that. The collection of three pockets can be hung on the wall in any order. You can use it as part of your home command center. You can also use each pocket in different rooms separately if that’s what you need. The sturdy metal design will hold even heavier items. These wall organizers are a hassle-free way to improve your organization around the house. Why it’s our pick? It’s a very versatile collection of mesh pocket wall organizers for home or office. The product is available on Amazon. We will always prefer accessories that bring decor value home. This rustic wood wall organizer is a cute choice for everyone who wants to improve their home organization in style. Especially if you love the rustic decor. 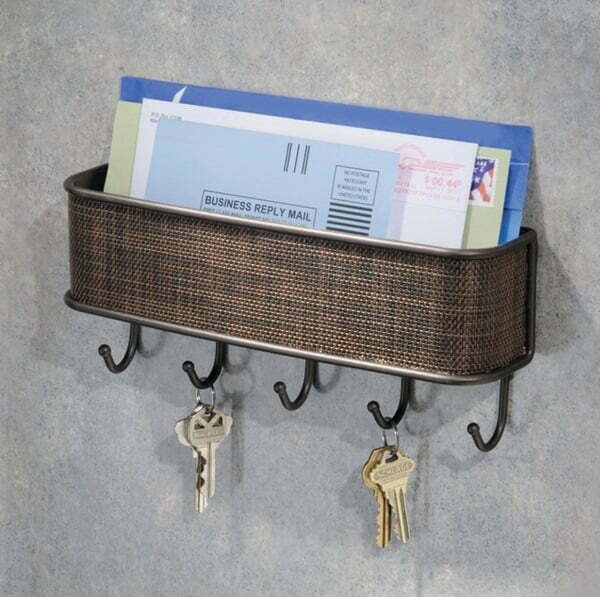 This mail holder with key hooks will work great in any entryway or mudroom. Especially if you’re after the farmhouse style or rustic accents. Made of wood, it will look like something you’ve crafted yourself! It’s a sure conversation piece. Why it’s our top pick? We love the simple rustic design. You can easily get Instagram worthy pictures with this organizer! Available on Amazon. If you’re on Pinterest, you might have seen these rustic jewelry organizers as DIY projects. They are lovely, but you don’t have to be a crafter to get one for your home. You can get one on Amazon. This jewelry rack is the perfect item for your bedroom in a rustic accent. You’ll love the look and its very useful. It will easily hold your entire jewelry collection. Why it’s our pick? 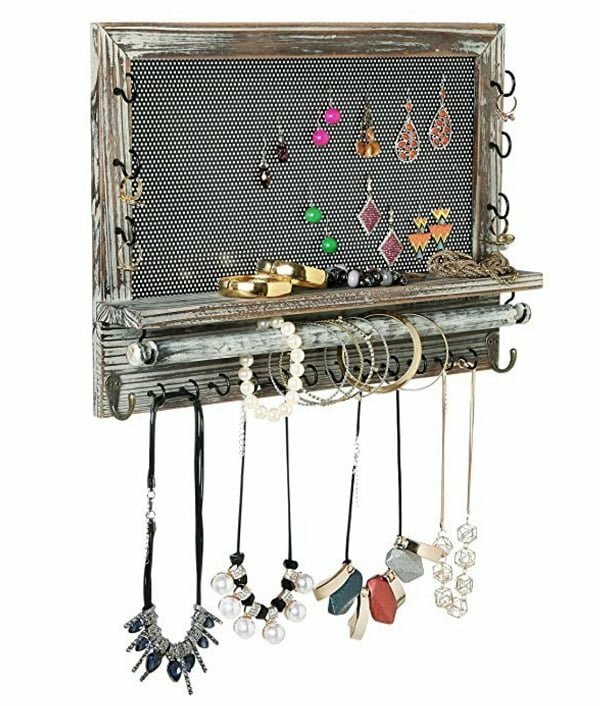 It’s the best rustic jewelry wall organizer available. The product is Amazon’s choice and everyone loves it. Available on Amazon.com. Another small and adorable wall organizer on the list. It will give you the much-needed storage space in the entryway, kitchen or any room and it will do it in style. The metal frame with woven plastic accents looks very attractive. It’s a small piece, but it will provide a lot of decor value. Especially if you’re going for the farmhouse look. Why it’s our pick? It’s a well designed stylish wall organizer for when you need something small. Available on Houzz.com. We love Etsy for its endless supply of rustic items for the home. 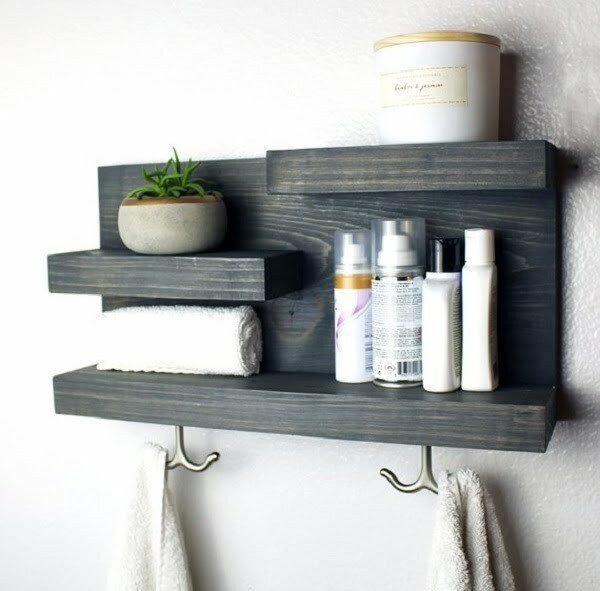 We’ve found this rustic bathroom shelf organizer and fell in love. It’s a great organizer for small bathrooms that gives you extra storage space and helps decorate the room. Made of solid wood in a rustic finish, this organizer will help you create the farmhouse look. It will prove useful and make a great conversation space for its handcrafted look. Why it’s our pick? It’s a solid wood wall organizer that improves storage and decor in the bathroom. Available on Etsy.